Historically, cafes and bars have been popular meeting spots for writers and artists to hangout. Many have used them as a source of inspiration and perhaps, sometimes even as an excuse to not work on their masterpieces. 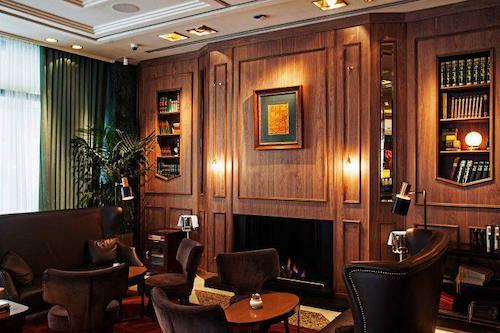 While Paris may have been home to many literary haunts, there are other such cafes and bars around the world which were frequented by famous authors. 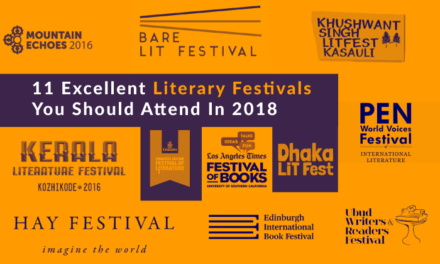 From Paris to Athens and from New York to Havana, this list covers 12 such literary haunts, which you should add to your itinerary next time you find yourself in that particular part of the world. 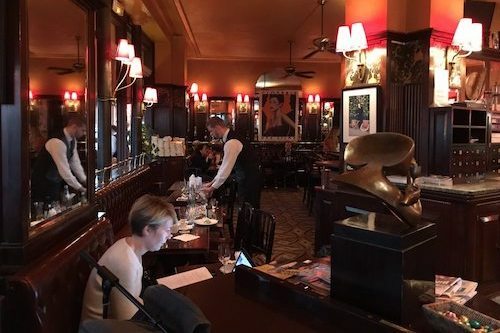 From 19th Century writers like Charles Baudelaire, Paul Verlaine, and Oscar Wilde to early 20th century authors such as Jean-Paul Sartre, F. Scott Fitzgerald, Ernest Hemingway, and Henry Miller, this cafe has been home to both French and American writers. Located near Montparnasse in Paris, legend has it that this is where Fitzgerald handed over the first manuscript of The Great Gatsby to his friend Hemingway, to read. Getting there: 171 Boulevard du Montparnasse, 75006 Paris, France. A frequent stop on the itinerary for existentialists Jean-Paul Sartre, Simone de Beauvoir and Albert Camus, this cafe was also frequented by other literary greats like James Joyce, Arthur Rimbaud, and André Gide. 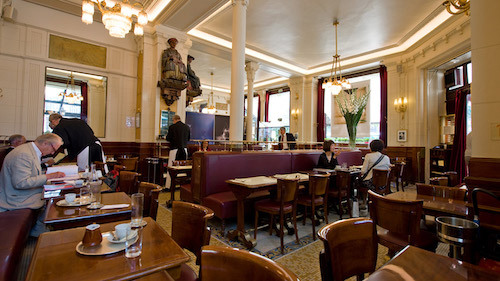 Known as Hemingway’s favourite spot in Paris, this Saint-Germain-des-Prés cafe became such a notable literary hub that, in 1933, it started offering its own literary prize. Getting there: 6 Place Saint-Germain des Prés, 75006 Paris, France. 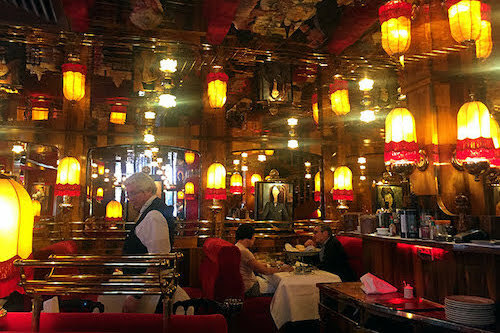 In The Sun Also Rises, Hemingway lamented, “No matter what cafe in Montparnasse you taxi driver to bring you to from the right bank of the river, they always take you to the Rotonde.” This famous Parisian cafe was also frequented by Gertrude Stein, Fitzgerald and T.S. Eliot. Unlike many other cafes, it still retains its bohemian charm. Getting there:105 Boulevard du Montparnasse, 75006 Paris, France. 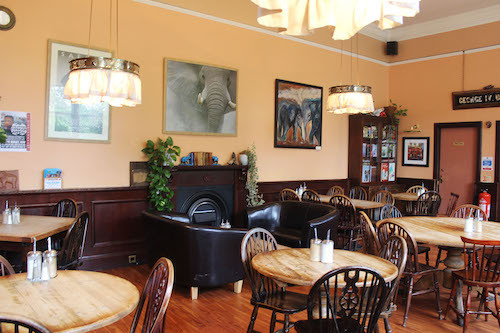 Located in Edinburgh, The Elephant House calls itself the ‘Birthplace of Harry Potter’ because this is where J.K. Rowling finished the first Harry Potter novel in the back room, overlooking Edinburgh Castle. Although most famous for its Potter connection, the café has also been frequented by Ian Rankin and Alexander McCall Smith. Getting there: 21 George IV Bridge, Edinburgh EH1 1EN, U.K. 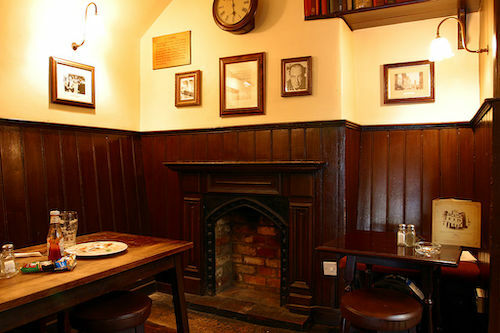 Located in Oxford, The Eagle and Child is best known for its association with the Inklings, a group of writers which included J.R.R. Tolkien, C.S. Lewis, Charles Williams, and Hugo Dyson. They would meet regularly on either Monday or Tuesday during lunchtime in a private lounge known as the ‘Rabbit Room’. While the membership changed over the years, Lewis remained a central figure till his death. The Rabbit Room still consists of memorabilia from the time of the Inklings. Getting there: 49 St Giles’, Oxford OX1 3LU, UK. For Stendhal, Caffe Pedrocchi was “simply the best in the world”. However, it was also a favourite hang-out of Lord Byron and others like Ippolito Nieve, Gabriele D’Annunzio and Marinetti, the founder of the Futurist movement. One of the biggest cafes in the world, it remained open ‘round the clock’ till 1916 earning it the moniker of the ‘Cafe without doors’. 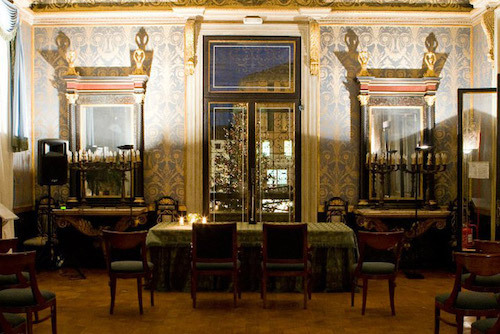 In 1848, the White Room of the cafe was the site of the student’s revolution against the Hapsburg rule and even today, there is a bullet hole in the wall. Getting there: Via VIII Febbraio, 15, 35122 Padova PD, Italy. Founded in 1760, and located close to the Spanish Steps, Rome’s oldest and most famous coffee house has been a popular stop for writers. It has hosted generations of writers from Lord Byron and Henrik Ibsen, to Percey Shelley and Hans Christian Andersen. John Keats who lived nearby was also somewhat of a permanent fixture at the cafe. Getting there: Via dei Condotti, 86, 00187 Roma RM, Italy. Established in 1939, Zonars’ history boasts a list of impressive regulars from Sophia Loren to Marina Abramovic and Valentino. In the 1930s, many writers dropped in while travelling through Greece, including Jorge Luis Borges, Henry Miller, Lawrence Durrell and Evelyn Waugh. Getting there: Voukourestiou 9, Athina 106 71, Greece. 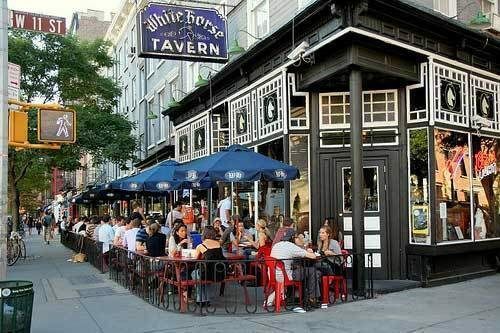 Infamous for being the bar where Dylan Thomas drank right before he died of alcohol poisoning, the White Horse Tavern has also hosted James Baldwin, Anaïs Nin, Hunter S. Thompson and Norman Mailer. Beat writers Allen Ginsberg and Jack Kerouac were often seen getting intoxicated here. According to a popular legend, Kerouac was tossed out of the bar several times and the words “Kerouac, go home!” were once found scrawled above the urinal. Getting there: 567 Hudson St, New York, NY 10014, USA. 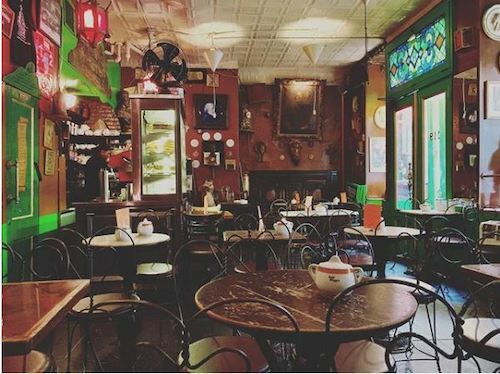 The oldest surviving cafe in Greenwich Village and the first place in America to serve cappuccino, Caffe Reggio has been around since 1927 and today features an antique coffee machine, a Renaissance-era bench from the Medici family, and paintings from the school of Caravaggio. It was also a favourite haunt of the Beat writers, especially Jack Kerouac and Gregory Corso. Bob Dylan and Andy Warhol also frequented this popular cafe. 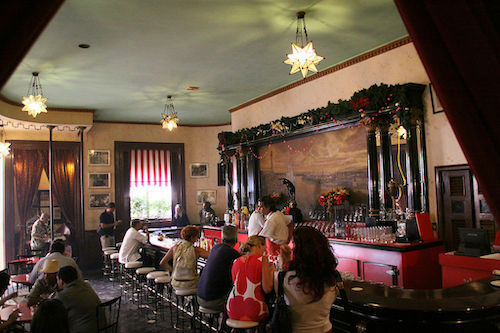 Getting there: 119 Macdougal St, New York, NY 10012, U.S.A.
El Floridita is the birthplace of the daiquiri and one of Ernest Hemingway’s favourite hangouts in Havana. His time there is immortalised through a life-sized bronze statue which sits at the bar, a bust drinking a daiquiri and a bunch of photos. Other patrons included Ezra Pound, Graham Greene, and John dos Passos. Getting there: Obispo, La Habana, Cuba. 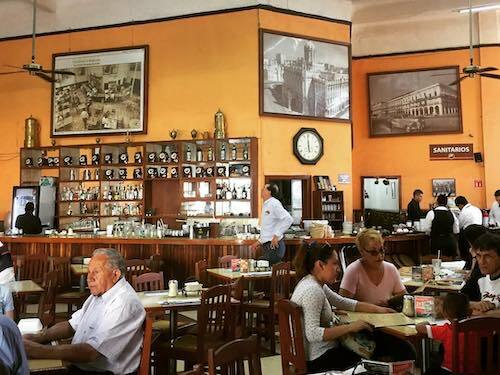 Since it opened in 1954, Cafe La Habana has not changed much and retains much of its old-school charm. Roberto Bolaño, Octavio Paz and Mario Santiago Papasquiaro frequented this place and legend has it that Gabriel García Márquez wrote some of One Hundred Years Of Solitude here. This is also where Fidel Castro and Che Guevara planned the Cuban revolution. Getting there: Calle Morelos 62, Juárez, 06600 Cuauhtémoc, CDMX, Mexico. 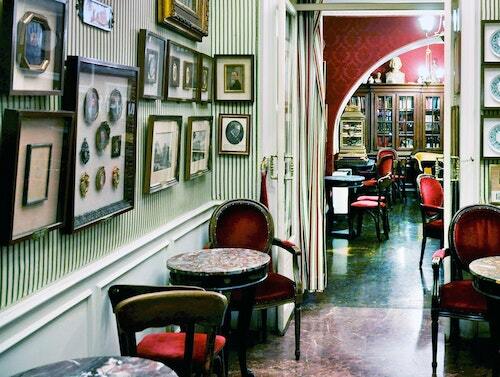 Have you been to any of these literary haunts? Are there any literary haunts we’ve missed? Share with us in the comments below.